Iguanas are certainly one of the most popular lizards to have ever been kept as a pet. Iguanas have strict feeding and housing requirements, can grow quite large, live a long time, and can be quite strong. They can be difficult to tame and become aggressive if not regularly handled. They are a big commitment and require a high level of care. This is not to say that iguanas cannot make good pets but they need the proper care right from the start and owners need to have the right expectations. Many new reptile owners do not realize how large their lizard of choice gets, how long they live, what kind of food is needed to keep them healthy, and all of the costs associated with these needs. As more and more people realized that iguanas are a large and long-term commitment, they have decreased in popularity. Iguanas are complicated animals. Captive iguanas need to be picked up and held for taming purposes. This is a challenge since human contact can seem unnatural to the animal and they may resist it. Baby iguanas can be quite quick but larger adult iguanas can become quite lazy and are very docile creatures, at least in their cage. When out of their cage, some iguanas might like climbing on their owner. They do have sharp claws, so wear protective clothing if your pet iguana likes this activity. Iguanas are never domesticated animals, will not often recognize their owners, and will try to escape if they are out of their cages. Additionally, a large iguana can cause real harm with its tail. An adult iguana is strong enough to break a human bone with its tail. While relatively rare, they are strong creatures and care should be taken, especially with small children or other animals present. Iguanas can grow to be up to 7 feet long (when their tail is included in the measurement) and they will weigh about 20 pounds (much larger than most people think an iguana gets). Therefore an aquarium or small reptile enclosure is a very short-lived home for a green iguana. Custom-built enclosures, and more often than not, bedrooms or large closets, are utilized for keeping pet iguanas safe and warm. Large enclosures also mean a lot of lighting. UVB and heat lights need to provide appropriate basking temperatures and areas for your reptile 10 to 12 hours per day. The iguana is a tropical animal. It wants to bask at 95 degrees Fahrenheit and the tank or room shouldn't drop below 75 degrees Fahrenheit. You can use heat lamps for this rather than hot rocks. Mercury vapor bulbs can be used for large enclosures or rooms. You can use compact fluorescent lights or tubes for a juvenile enclosure. Large branches and shelves in the enclosure will allow your arboreal iguana to climb up to and enjoy basking in the warmth of these lights (which should reach 120 degrees Fahrenheit). Fresh food is the key to a healthy iguana. Old thought processes included feeding cat food to help bulk up iguanas quickly but owners found out that all that protein caused kidney failure in their pets and their lifespans were shortened greatly. Iguanas in the wild are strict herbivores, so they are not evolved to eat animal protein and they don't eat insects except by accident. Dark leafy greens, some fruit, and calcium supplementation must all be provided to keep your iguana healthy. Fruit and calcium supplementation should only be added about once a week to the diet. Young iguanas need to eat daily while older iguanas may prefer an every other day schedule. Avoid diets high in protein with your iguana. You may want to monitor your iguana's blood chemistry to ensure it is getting enough calcium and other nutrients. Iguanas need fresh water when feeding and between feedings. The temperature of their housing plays a part, too, as Iguanas need a temperature of about 85 degrees Fahrenheit in order to digest their food properly. 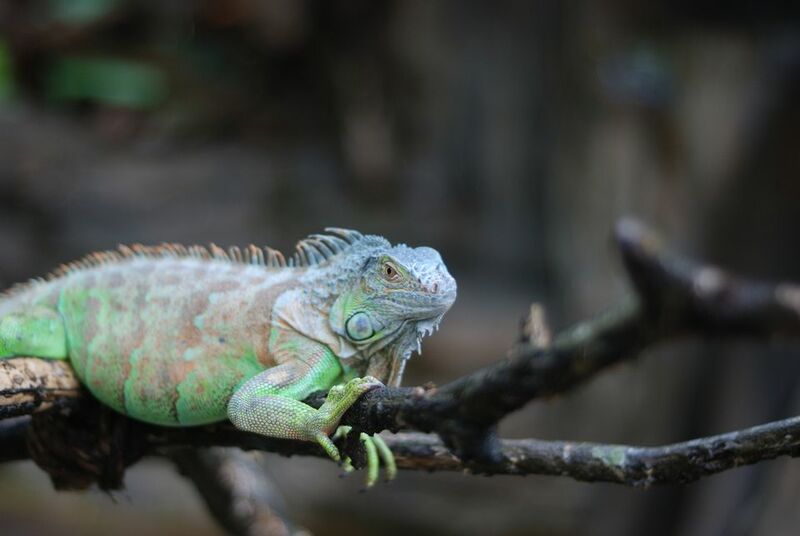 Like most pet reptiles, it has been found that iguanas carry salmonella, meaning it is present in the digestive tract without causing disease. Following common sense hygiene practices when handling iguanas should prevent humans from having any problems related to this bacteria but if there are young children, pregnant women, immunocompromised people, or elderly persons in contact with the iguana, extra care will have to be taken to prevent salmonella infections. If the iguana is to live in a household with people that fall into any of the aforementioned groups, a reptile may not be the right pet for your family. When extremely stressed or frightened, an iguana's tail can fall off. They do grow back, but may not look as large or as beautiful as the original tail. Don't be fooled by a pet store selling you a small iguana and telling you it will stay that size. While some stores sell baby iguanas, they will grow large very quickly. Consult with a reputable pet store that fully informs you of the commitment you are making with a pet iguana. Check your local laws or consult with an exotics vet to confirm the legality of owning a pet iguana. Buying one should not be taken lightly. You'll also need an exotics vet who can care for iguanas and is easily accessible. Otherwise, check out other reptiles and amphibians that can be your new pet. Do Iguanas Make Good Pets? Do Coatimundi Make Good Pets? Do Wallabies Make Good Pets? What Do Tarantulas Eat, Why Do They Molt, and Can You Hold Them? Are You Interested in Reptiles to Be Kept as Pets?